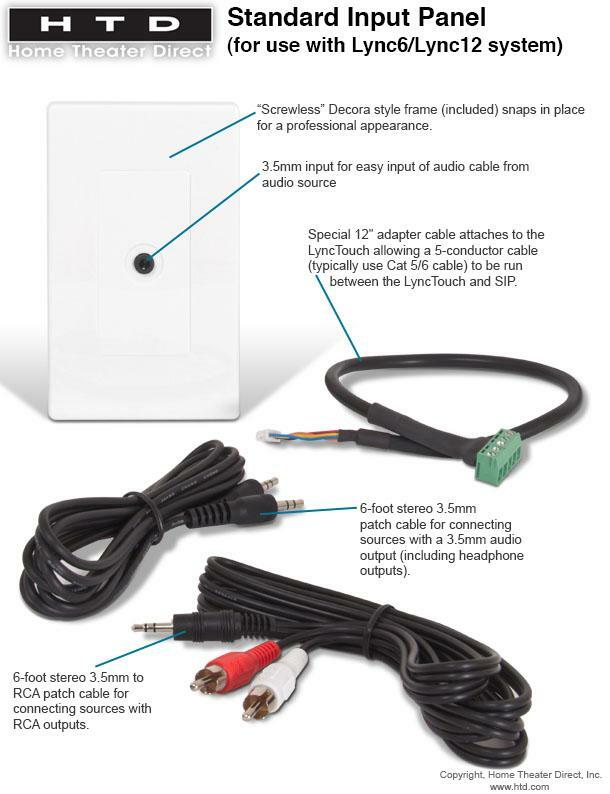 This attractive "screwless" Decora-style input panel is used to connect a source component (iPod or iPod dock, TV, computer, CD Player, etc.) located within a zone into the Lync sytem, making the source available to all zones. The SIP connects directly to the back of the LyncPad using any 5-conductor cable (we recommend using 5 conductors from a Cat5/6 cable) which should be run behind the wall. The SIP is typically located near the source but out of sight, e.g. behind a TV, bed, or nightstand or in an equipment closet or cabinet. Stereo 3.5mm and RCA connection cables are included. Use this Standard Input Panel (SIP) to conveniently connect a component located within a zone (i.e. NOT centrally located), such as a CD player, cable/sat TV box, computer, iPod, etc., into the Lync system. Simply connect from an analog stereo output on your component to the Source Input Panel. The signal is sent to the back of the LyncPad using any 5-conductor cable (or 5 conductors from a Cat5/6 cable). The LyncPad uses its built-in analog-to-digital converter to transer the signal into the Lync system using the same Cat5/6 cable that connects the LyncPad to the Lync Controller. The SIP is designed to fit a Decora-style cutout. We provide an attractive "screwless" wall plate, but you can instead choose to install the input panel using your own Decora-style wall plate, including a multi-gang plate. Note that you can still use the LyncPad's built-in 3.5mm input. When a component is connected directly to the 3.5mm input located on the front of the LyncPad, its signal will override the signal coming from the Source Input Panel. Stereo 3.5mm input for easy connection to an analog source. Stereo 3.5mm patch cable (2m/6ft) and stereo 3.5mm to RCA patch cable (2m/6ft) included.